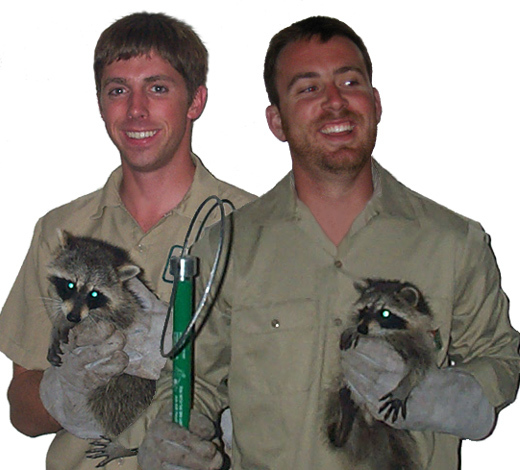 About Us - Information about Our Baltimore County Maryland wildlife removal experts. Over five years of wildlife control experience. Fully trained on latest wildlife control techniques and tools. Fully licensed by the Maryland Wildlife Commission. Extensive experience with professional home repairs. Trained in attic cleanup and decontamination. We give a written work estimate and written guarantee of work. We treat wildlife in a respectful and humane manner. We are available 24/7 via cell phone. We schedule fast appointments, and arrive on time. We treat our customers the way we'd like to be treated. We make trusted referrals for plumbers and electricians that can repair animal damage. For same-day electrician services, please contact Clinton Electric at 410-453-9800. We a complete job, from start to finish. We remove wildlife humanely and effectively, using the proper traps, tools, and techniques for each unique animal and situation. When we encounter animals inside a house, we inspect every part of the house, from ground level to every part of the roof, to identify all the areas of entry, and all vulnerable areas, and we perform professional repairs, with guarantee, to seal entry holes shut. We inspect inside the attic to find any damage or biohazard, and provide full cleaning services. We offer attic decontamination, poison-free and permanent rodent control, bat colony exclusion, bird prevention, snake removal, dead animal removal and odor control, and more. As a Mid-Atlantic city, we have an abundance of squirrels, raccoons, opossums, skunks, and groundhogs. There are some snakes in Eastern Maryland, but they are usually harmless. The most common bats are the Little Brown Bats or the Big Brown. In the city of Baltimore, we often handle rat problems and pigeon issues. We service the greater Baltimore region, including Anne Arundel County, Baltimore County, Carroll County, Harford County, Howard County, and Queen Anne's County. We service the towns of Columbia, Towson, Aberdeen, Annapolis, Bel Air, Catonsville, Dundalk, Ellicott City, Glen Burnie, Havre de Grace, Joppatowne, Owings Mills, Westminster, and more. What to do if you find a lost pet? If you are a pet lover, it can be a gut wrenching feeling when you notice a frightened, alone pet on the side of the road just wandering aimlessly around by itself. It doesn’t matter what kind of pet it is – a cat, dog, ferret, rabbit, or anything else; leaving the poor creature out by itself can be a recipe for disaster, especially when you consider traffic in the roads and similar. There are a couple of steps that you should take if you have found a stray pet. Obviously you need to first make sure that the pet is actually alone and the owner just isn’t a little while behind or in front. Once you have established this, you must remember that this animal is like to be petrified, especially if it is not used to being out on its own without the guiding hand of their loving owner. Large and sudden movements are NOT a good idea in this scenario – the last thing that you are going to want to do is frighten the creature and encourage it to bolt, especially if you are around an area of high traffic when it could run the risk of being run over. Now this is easier said than done, but restraining the animal in some manner is always a good idea, but you must make sure that you are not putting yourself in any danger by doing so. You don’t know if that stray dog is angry and going to bite, that rabbit could be diseased; the cat could have rabies. These are not always common situations, but in short – you never know! Talking in a calm and low voice tends to work rather work with frightened animals; you are going to need to reassure this creature that you are his or her friend and not the enemy. If you are lucky enough to have some kind of food with you, you have a higher chance of winning over the pet. You do need to be somewhat careful about this however; some human foods can be very toxic for animals, for example, dogs and cats cannot eat chocolate. If you do manage to win over the animal, try to pick the critter up with a blanket or similar if it is small enough to do so. Remember that the creature is going to lash out at you, so the blanket or a jacket is always a good idea. You can chose to drive the animal to a shelter or vet, but leaving an animal roaming around your car is not always the best idea! If you can, try to get the animal into the back of your car somehow; either picking it up or luring it in with food, and call the animal services, either a local vet, shelter or animal control company to come and give you a hand. If you take all of the above steps, you are doing everything in your power to ensure that this animal is kept safe and returned safely back to its owner. To learn more about our services, visit the Baltimore wildlife removal home page.